Láki SH55 is a traditional oak fishing boat, giving an elegant ride. This charming boat is excellent for sea angling and birdwatching with its slow rocking motion and open deck. It is a quiet boat that can get up close to the cliffs where the seabirds nest and has enough room for passengers to move around, getting the optimum view of what they are watching. We use Láki for summer puffin tours as well as the sea angling trips. Láki II is a fast, modern twin-engined passenger boat, built for comfort and speed. This boat is perfect for deep sea whale watching as it can get to the whales quickly. 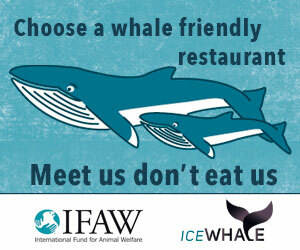 It is a powerful boat and has indoor seating so that passengers can relax between whale sightings. We use Láki II for the summer whale watching tours from Hólmavík. Our new boat Íris was built as a rescue/floating healthcare boat for Norwegian offshore islands. It is twin engine powered and designed for a smoother ride in higher seas. 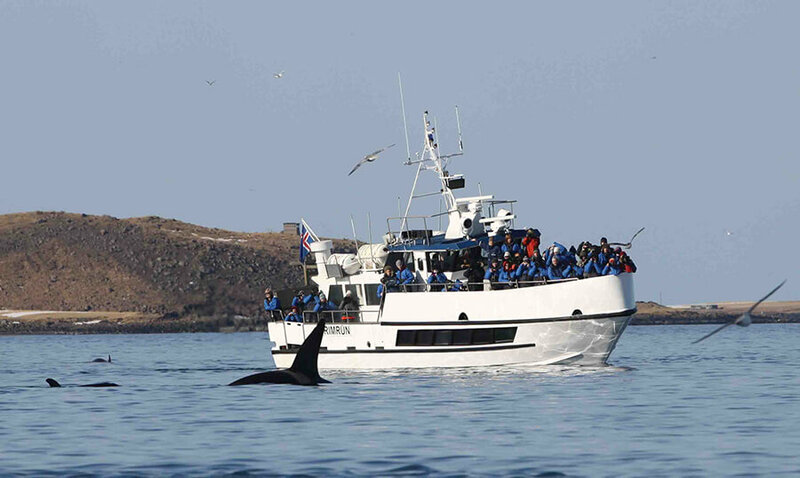 Láki Tours has converted the boat into passenger vessel for 75 people, with a below-deck saloon containing a comfortable seating area and an upper deck for great whale viewing. Iris will be used for our whale watching tours from the Snæfellsnes Peninsula. All our boats are registered with the Icelandic authorities and comply with all the required safety standards. We have two boats for our trips, Láki SH55 which is a traditional oak fishing boat, giving an elegant ride. This charming boat is excellent for whale watching and birdwatching with its slow rocking motion and open deck. It is a quiet boat that can get up close to the cliffs where the seabirds nest and has enough room for passengers to move around, getting the optimum view of what they are watching. We use Láki for summer puffin tours as well as winter orca watching tours, so that we can approach slowly, silently without disturbing the orcas in their natural behavior. Láki II is a fast, modern twin-engined passenger boat, built for comfort and speed. This boat is perfect for deep sea whale watching as it can get to the whales quickly. It is a powerful boat and has indoor seating so that passengers can relax between whale sightings. We use Láki II for the summer whale watching tours from Ólafsvík and also in the winter if the whales are further away. 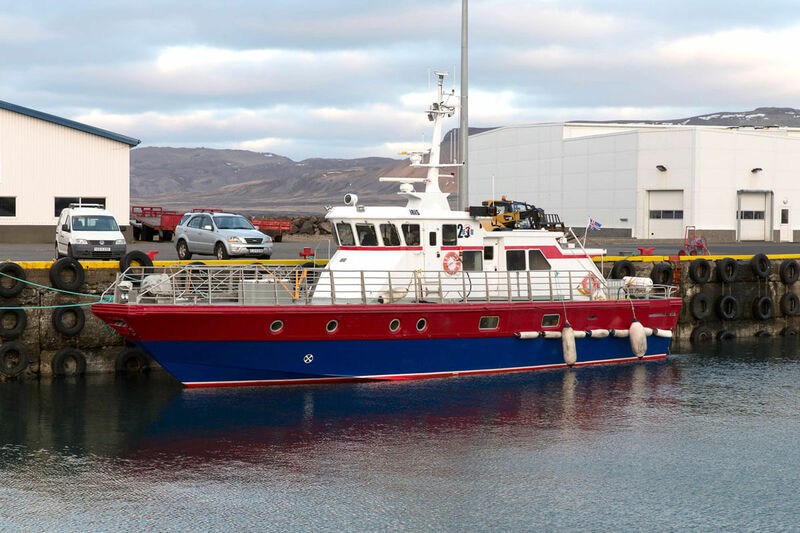 Both boats can take up to 40 passengers and comply with Icelandic safety regulations. Our New boat Íris was built as a rescue/floating helthcare boat for Norwegian offshore islands. It is twin engine powered and designed for a smoother ride in higher seas. 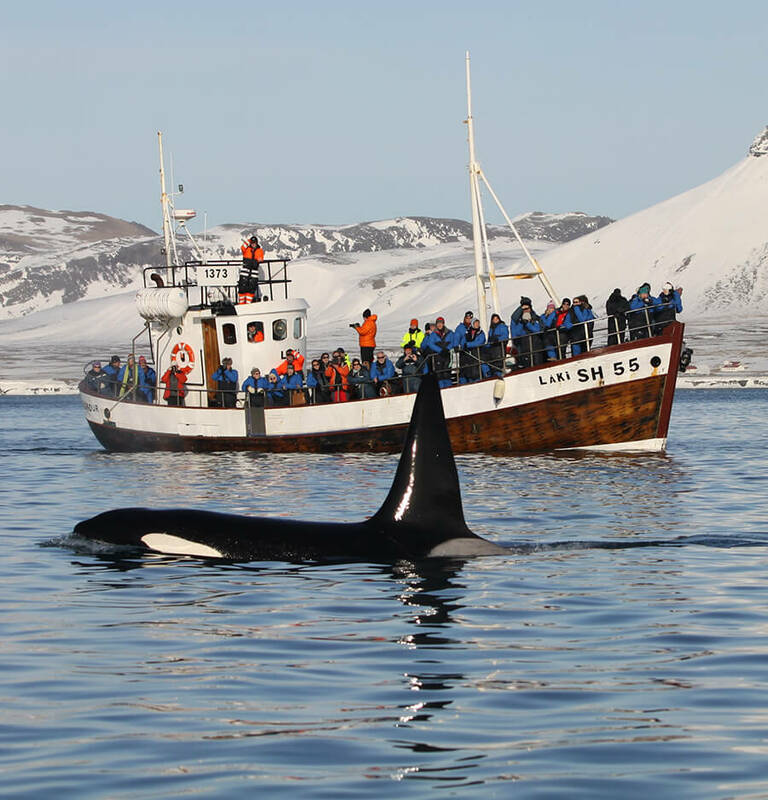 Láki Tours has converted the boat into passenger wessel for 75 people, with a below-deck saloon containing a comfortable seating area and an upper deck for great whale viewing. Iris will be used for our whale watching tours from the Snæfellsnes Peninsula. She is registered with the Icelandic authorities and complies with all the required safety standards.